The first season of F1 that I really watched was 2009 and the title decider came down to the final race of the season – Brazil. Mark Webber won the race but Jenson Button came 5th (not even on the podium!) and was crowned world champion. Post race press coverage was all about Jenson and not much attention was given to poor Mark Webber. I really felt for him that day and decided I would support him from then on! During his F1 days he drove for Red Bull (and Jaguar and Stewart Racing before that) and had a rocky relationship with Sebastien Vettel. During 2010’s British Grand Prix, the new style nose on Vettel’s car broke during practice and the team decided to give Webber’s nose to Vettel. Webber was not amused as it showed favouritism towards Vettel. It was probably the best thing that happened as Webber went on to win the race and after winning came on to say “not bad for a number two driver eh?” which I loved!! He also suffered a bad crash in the European Grand Prix. How on earth he managed to walk away unscathed still baffles me! The 2010 season was his best chance at winning the championship. The final race saw five drivers in contention – Webber, Vettel, Alonso, Hamilton and Button. Unfortunately my man didn’t win but came 3rd! The 2011 season saw Webber come 3rd in the championship again and the stand out moment came at the Chinese Grand Prix where he qualified in 18th and finished on the podium! Was a fantastic race! 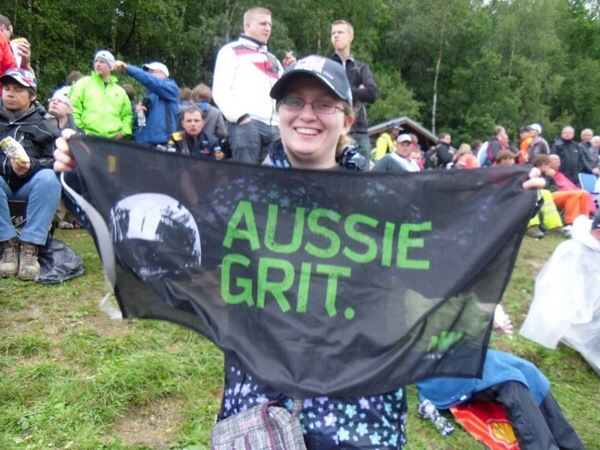 Me at the Belgian Grand Prix 2011! Another controversy occurred at the British Grand Prix where the team told him to “maintain the gap” to Vettel so as to ensure Vettel would score more points and lead the championship. Webber didn’t listen (much to the team principal’s frustration!) but couldn’t pass Vettel! 🙁 He finished in 3rd place in the championship. 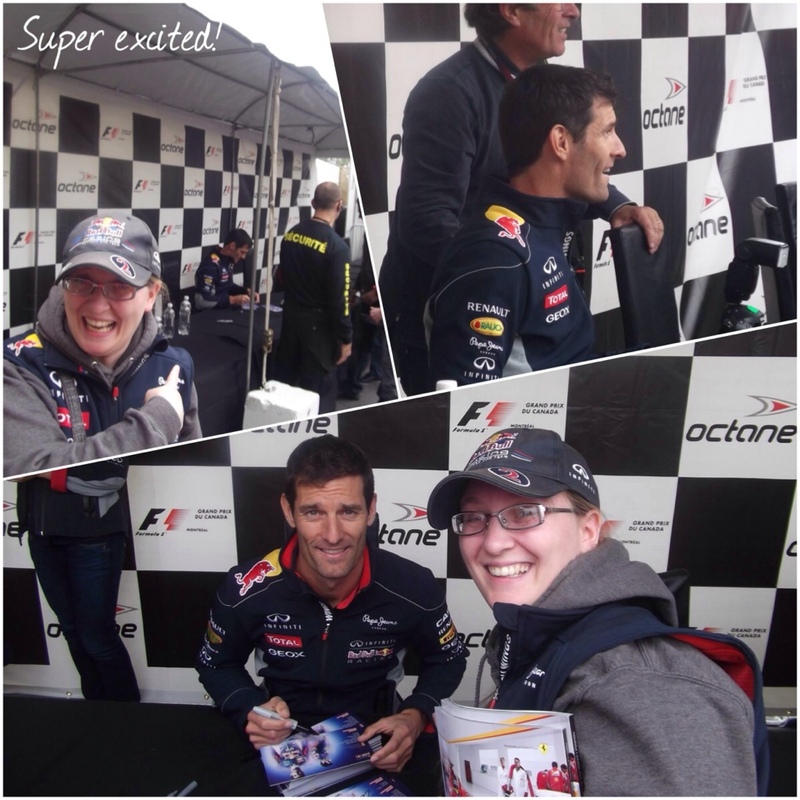 Rumours were flying around that this would be Webber’s last season in F1 so I decided I wanted to go to Silverstone! I said I wanted to see him win at Silverstone before he retired…. and I did!! After the race he confirmed that he had signed for Red Bull for one more year – yay!! He won the Monaco Grand Prix for the second time – so in my opinion he won the best two races of the season! The rest of the season was a write off really and he finished 6th in the championship. This was Webber’s last season in F1. The unforgivable moment of this season was of course the “multi 21” saga. In the Malaysian Grand Prix, Webber was winning with Vettel behind him in second place. The team ordered Vettel to stay behind him and not try to overtake. Vettel didn’t listen and overtook Webber regardless. To say that Webber was pissed off is an understatement. The tension on the podium was palpable! This move did not endear Vettel to the fans…. he was booed in numerous grand prix since then – including me at the Canadian Grand Prix! 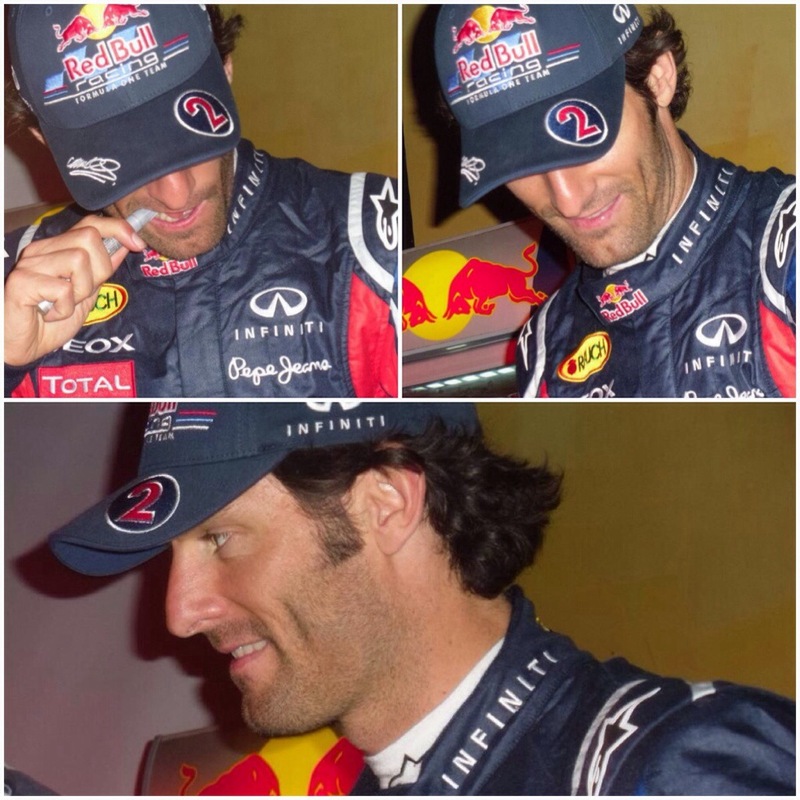 Petty maybe but my loyalties lie with Webber! The stand out moment for me was meeting Mark (again!) in Canada! It was awesome! I was wearing my “I love Mark Webber” hoodie and hubby said to Mark to have a look at what I was wearing. He said it was awesome (although I think he was a bit scared!) and his PR team thought it was fabulous and put it on Twitter and Facebook!! Sadly Mark retired at the end of the season with Brazil being his last race in F1. He finished in 2nd place and so at least was on the podium even if it wasn’t on the top step. I will admit, I cried when I saw him on the podium for the last time!